Enthusiastic youngsters have marked the official opening of Beaconsfield’s $850,000 state-of-the-art skatepark with kick-flips and bunny-hops. It completes the development of Holm Park Recreation Reserve, which less than a decade prior was described as a “serious bushfire risk”.The site consisted of quicksand, overgrown grass and monstrous weeds and was reportedly such an eyesore that neighbours feared their property values would plummet. While a “ribbon-cutting” took place on Thursday, the park has been open for a number of weeks, attracting teens from far and wide. Tim, 16, from Dromana, already wants to see the facility expanded. “It’s a good skatepark but sometimes there’s so many kids here that there isn’t enough room to ride and do tricks,” he said. The project was joint-funded by the Turnbull Government – contributing $500,000 – and Cardinia Shire, forking up the remaining $350,000. It also included the resealing of Holm Park Reserve’s car park. 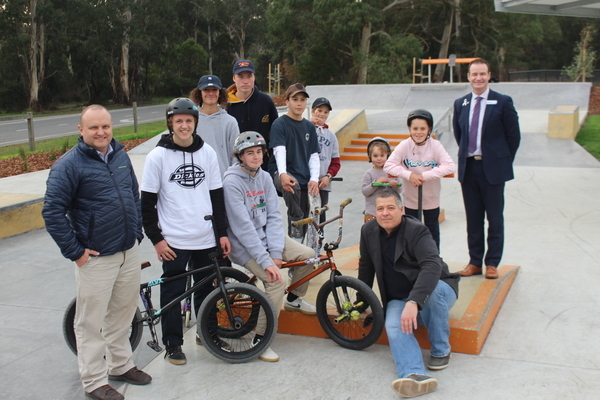 Mayor Colin Ross said council were supported immensely by young BMX, skateboarding and scooter enthusiasts who sacrificed their free time to shape the facility. “We had a committee – made up of young people – which helped us shape the design of the project and provided feedback and suggestions,” he said. “When I started on council 10 years ago, this was a potential bushfire problem and now it is a facility where young people can play and one that even hosts VFL matches. The concrete park features an open bowl, several ledges and rails, a “curb spot”, orange banks, footpath connections and a shelter. A drinking fountain is set to also be installed in the coming months. LaTrobe MP Jason Wood, who secured $500,000 on behalf of the Federal Government, said projects like these are aimed to keep kids happy, active and off the streets. “I was driving past the other week and it was absolutely packed,” he said. “With Beaconsfield’s growth, it is a fantastic addition.